Boyd Graham was born June 18, 1910 in Gainesville. After serving as a first sergeant in the Army Air Corps during WWII, Boyd was a stock clerk for the Southwest Drug Company when he joined our lodge in 1946 but already, he was running his own small company “Graham Embroidery” which he began in 1940 with his wife, Irene, out of their garage. By the 1960s, the business had grown to such that they were able to move into a separate office building. It became known as the largest exclusive chenille & embroidery plant in the United States. The business continued growing through the years and Boyd’s sons ultimately took over until they sold they company in 2012. 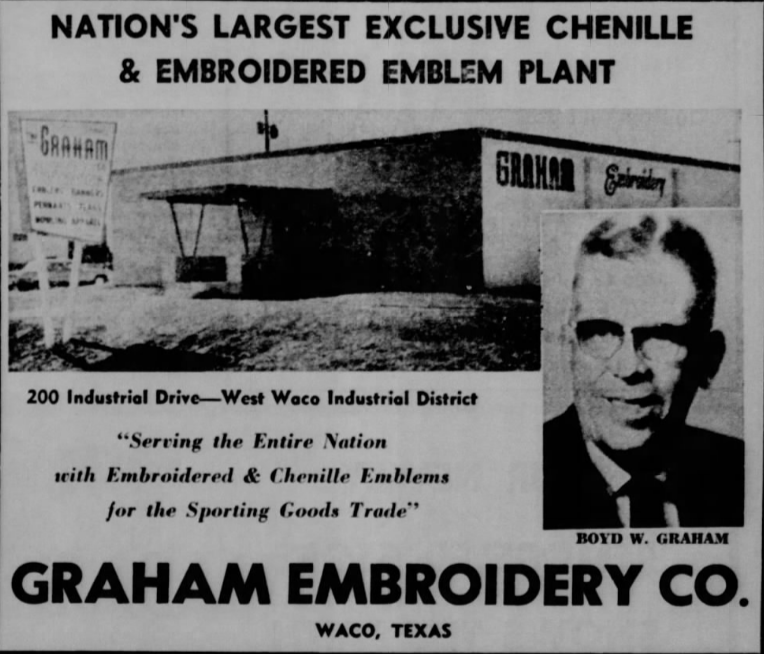 Today, Graham Embroidery continues to make finely crafted products for Wacoans with a primary focus on patches for letterman jackets and similar items. Masonically, Brother Graham was ever a faithful servant. 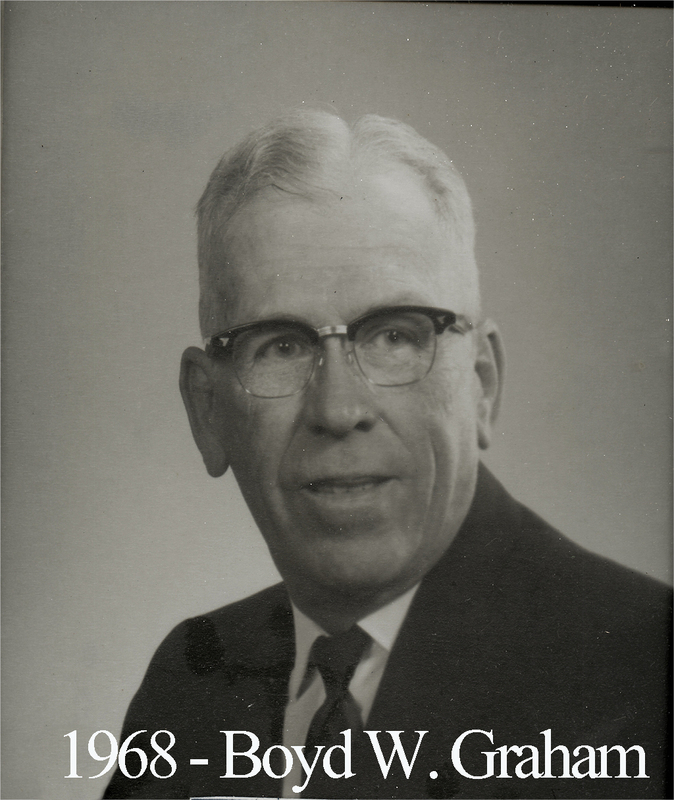 He belonged to most of the area masonic organizations and served as the Master of Waco Lodge in 1968. During his year as Master of the lodge, Brother Graham assisted Past Grand Master Lee Lockwood and Past Grand Orator W.R. White(president of Baylor and fellow member of Waco Lodge) in the services in 1968 at Oakwood Cemetery at which Past Grand Master grave markers were added to the graves of two members of our lodge: Pat Neff and Alva Bryan. When our current building was finished in 1969, Brother Graham presented the lodge with U.S. and Texas flags with stands for our lodge room. He also donated a new ice maker. 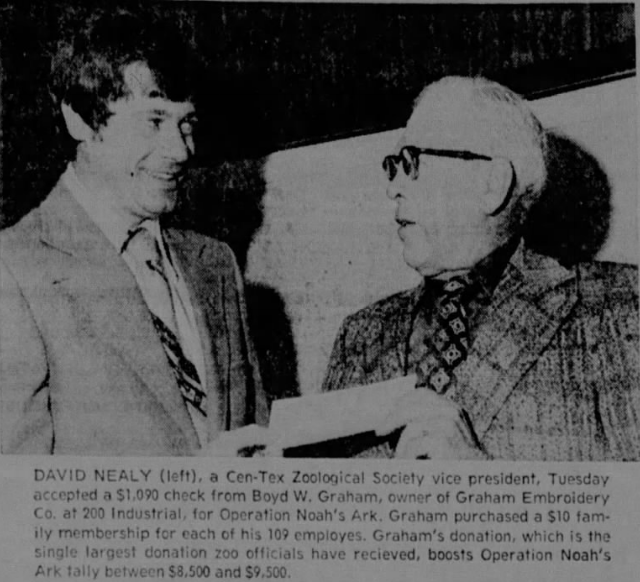 In 1974, Brother Graham made what was, to that point, the largest ever donation to the Central Texas Zoo(now known as the Cameron Park Zoo) for “Operation Noah’s Ark” which helped propel the zoo forward and sustain it. This was only the beginning of what became an annual tradition of the Grahams as financial patrons for the zoo for the rest of his life. Boyd Graham passed away on December 31, 1980.